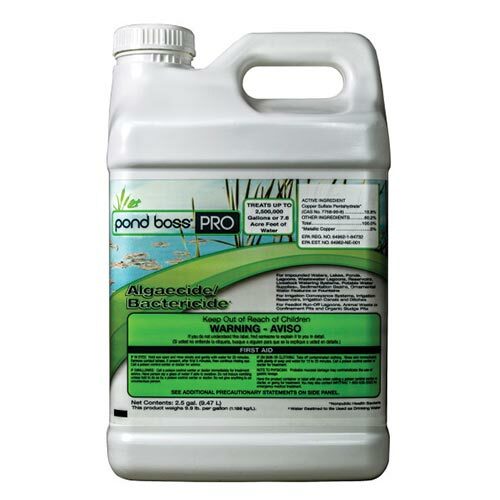 The Pond Boss PRO Algaecide/Bactericide is formulated to prevent algae from building up in your water feature. This product is designed to be applied in lakes, ponds, impounded waters, wastewater lagoons, reservoirs, livestock watering systems, potable water supplies, sedimentation basins. Additionally, this water treatment can be properly used in irrigation conveyance systems, irrigation reservoirs, irrigation canals, irrigation ditches, feedlot run-off lagoons, animal waste or confinement pits, and organic sludge pits.